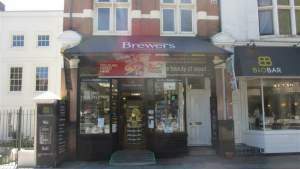 Our Brewers Decorator Centre in Chiswick has been a decorators’ merchant for more than 30 years, selling high quality products to trade and retail customers. We used to be known as Palmers Paint and Wallpaper, but in October 2014 we joined the Brewers family. Our regulars, already loyal for our excellent service and expert product advice, were delighted to find our range of paints and wallpapers expand. And if we don’t carry what you need in stock, we can usually have it in store within a few days. You’ll find us on the corner of Chiswick Lane and Chiswick Road, just down from the Hogarth flyover. The shop is perfectly accessible for wheelchair users and, given the usual issues with parking in London, we can easily arrange for local delivery to your site or home. From Chiswick Lane leading on to Chiswick High Road. At the end look left to see the store. From Chiswick High Road travelling towards King Street. The store is on the right where the road meets Chiswick Lane. Travelling from King Street on to Chiswick High Road. The store is on the left where the road meets Chiswick Lane.